I’m always on the lookout for new online business opportunities. The latest trend that is taking off is dropshipping custom t-shirts. There are a lot of YouTubers that are promoting this method of dropshipping. While I’m sure they have found success dropshipping custom shirts, I think most of the promotion is to help sell their own online courses. I did some of my own research and experimented with what it takes to create custom t-shirts. I’ll share what I’ve learned and my final thoughts on the entire business model. Why Dropship Custom T-Shirts? How is it Different From Other Dropship Products? Creating custom t-shirts is nothing new. Print on demand services have been around awhile and people have been earning income with their own designs for years. However, the reason why print on demand t-shirts are quite popular in terms of online businesses is that you can earn quickly if you follow trends. Many of the YouTube videos I’ve watched outline the entire process. I signed up to a couple of print on demand services to learn how it works. Target a Niche – Find a niche that you want to promote to. This is no different than finding niches for a regular dropshipping business. Find What is Trending – You can search Google Trends for data. If you can come up with a catchy slogan, particularly on a trending topic within your niche, you increase your chance of making sales. Create Your Design – You don’t have to be a graphic designer to have your t-shirt designed. You can outsource this work to a t-shirt designer on Fiverr. Upload Your Design to a POD Service – Once you have your design, you can upload it to a print on demand service such as Teespring or Printful. Open a Store – The most popular platform being used for dropshipping custom t-shirts is Shopify. If you prefer not to pay monthly store fees, you can also use WooCommerce with WordPress. There are many POD services that are compatible with WooCommerce. Buy Shout-outs From Instagram Influencers – You have to get your new t-shirt design in front of your target audience. That means finding Instagram accounts within your niche with large followings. You can do this step before designing your shirts to ensure you have accounts that are willing to promote your products. How is this Different from the Usual Dropship Model? After all of my research, the big difference is having to come up with your own custom designs. This is a bit more work in comparison to finding a product to sell on AliExpress. 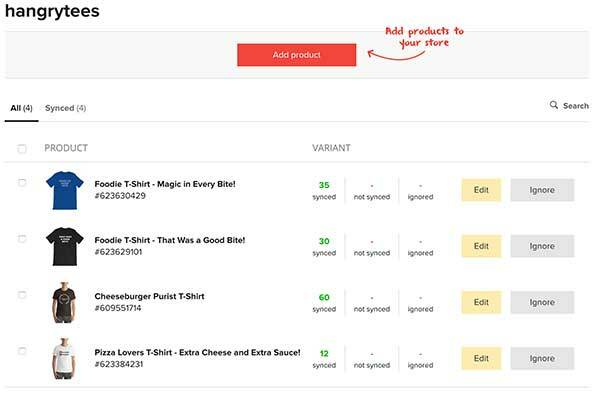 Once you have a t-shirt designed (your product), the dropshipping process is the same. A customer orders a shirt, the order is passed to your POD supplier, they ship the item to your customer, you make a profit. In the end, it is still dropshipping. 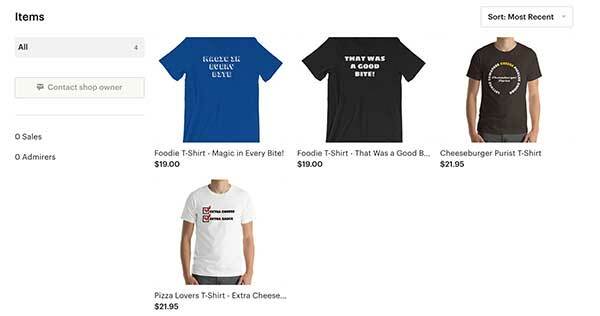 It is just a different product and many custom t-shirt dropshippers are cashing in on trends. You can find trendy products on AliExpress as well. As I mentioned earlier, creating custom print on demand merchandise has been around for years. In fact, you do not need to use Shopify to sell your print on demand items. As I learned more about using Printful, I found that they also connect to the Etsy platform. I created some designs to test out how to use Printful and followed the process of creating an Etsy store in order to connect it to Printful. I then followed the instructions to connect my Printful account to my Etsy store. I made my account on Etsy first as you have to set up billing information. Promoting your Etsy store works the same way that you would with a Shopify store. It depends on which platform you prefer. It cost me $0.20 cents per listing on Etsy plus any other fees they may charge for when an item sells. 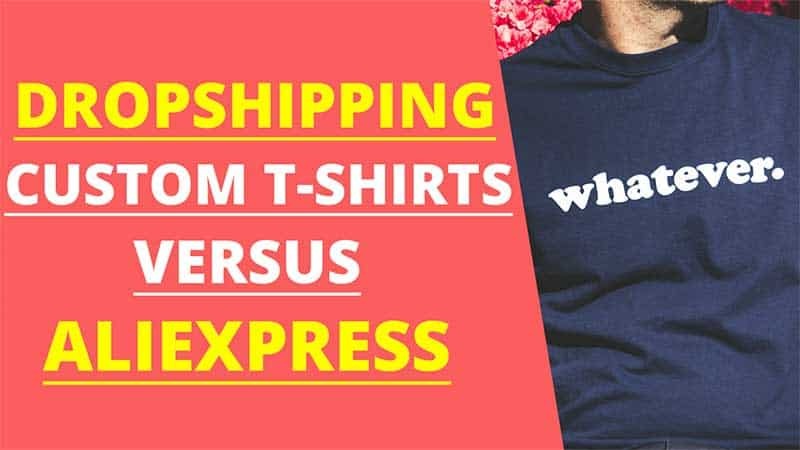 Should You Dropship Custom T-Shirts or AliExpress Products? While there are a lot of YouTube marketers promoting the perks of dropshipping custom t-shirts and even making claims that dropshipping with AliExpress is dead or old, take it all with a grain of salt. I have watched many videos in which the dropshipper has stated they will continue to dropship using AliExpress. In the end, you’re still dropshipping products. What makes custom t-shirts alluring is that you can ship from the U.S. and the sales are good when you can jump on a trend. However, as it’s been stated before, shipping times from AliExpress does not hinder dropship store owners from earning income. I like the creativity involved with creating custom t-shirts. It is fun to come up with new ideas for a design. If you have experience with graphic design, you can really have fun creating your designs yourself. What is Difficult About Selling Custom T-Shirts? I think the most challenging part of dropshipping custom t-shirts is staying on top of trends within your niche. It can be difficult thinking of designs for your shirts. You must also be extremely careful about copyrights and trademarks. 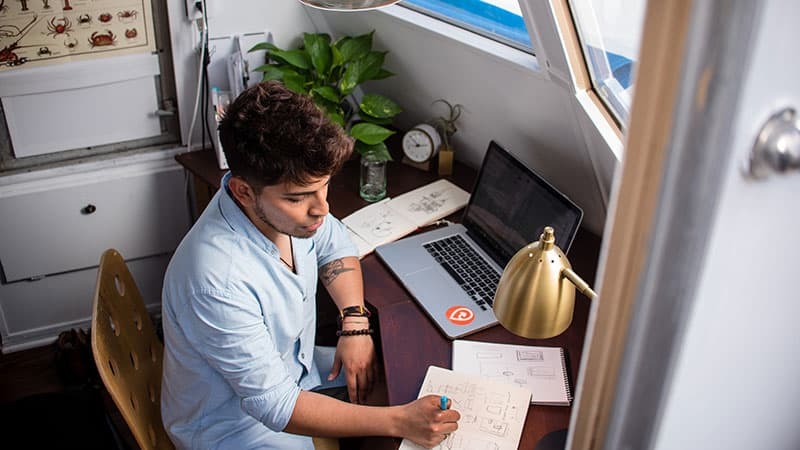 It is tempting to jump on a trend and want to use a copyrighted image or trademarked phrase in order to make quick sales but you’ll be asking for trouble if you do. Getting started is not difficult. In fact, it is quite easy with the services available and various resources that you can use. Of course, you will need a niche. You will need to do your own research and figure out what you have an interest in. Shopify or WooCommerce – Both platforms will get the job done. There are many print on demand services that are compatible with each. The difference is that Shopify requires no software set up whereas WooCommerce requires WordPress which needs to be installed. Print On Demand Service – I experimented primarily with Printful and Teespring. I think most POD services will work well. Check the pricing on their products as well as if they offer the products that you want to customize. Graphic Designers – There are plenty of custom t-shirt designers on Fiverr. They all vary in price but you can find some great designers there. If creating custom t-shirts sounds interesting to you, it doesn’t hurt to explore it. You may find that you’re good at finding trends and coming up with design ideas. However, dropshipping with AliExpress is still an awesome way to have an eCommerce store that caters to a particular niche. You may find that it is easier to sell AliExpress products as there is a huge variety and you are not having to come up with design ideas. It really is a matter of personal preference. If you can do both, even better. It never hurts to have multiple streams of income. Getting a custom-made AliExpress dropshipping store is an ideal way to get your own dropshipping business. You’re able to sell a wider variety of products in your niche, including t-shirts. What is your opinion on this custom t-shirt dropshipping trend?